Lately I’ve been watching Adam-12 reruns on Antenna TV, partially because I’m always an easy fan for cop shows & this one holds up surprisingly well. It doesn’t have the campiness of Dragnet, the other Jack Webb cop show of the era, but also shares the meticulous attention to actual police procedure. While watching any old TV shows provide constant “Hey, it’s THAT guy!” moments of spot-the-familiar-character actor, Adam 12 has the added bonus of the tons of location shooting done for the show, centered around a pair of beat patrol cops in late ’60s-early ’70s Los Angeles. We get a double dose of location as well – the background shots while we follow their in-car conversations as well as the scenes where Reed & Malloy are out of the car talking to victims, witnesses or chasing suspects. Being familiar with the Studio City/North Hollywood neighborhoods of LA’s San Fernando Valley is a big help. The show was done out of Universal Studios which sits next to both, so those areas tended to be the go-to locales for various episodes, along with downtown LA and some recognizable bits of Griffith Park. It’s the commercial architecture I’m most interested in – I’ll recognize a stretch of a familiar main drag like Lankershim Boulevard or Vineland Avenue – only the banks & restaurants are all different, the gas prices are 10% of what they are now (literally), and the signage gives the streets an eerie “lost world” type vibe. I get a window into the realm of my daily errands from 40 years ago. I suppose if I wanted to see 30 years ago with a lot more of the West Side involved, I’d rewatch Rockford Files, which is unfortunately not in the regular rotation of any of my current cable line-up. To go back even further, however, means looking at old movies, especially silent films, which were shot as the city itself grew & expanded. In Act Of Violence from 1948, there are wonderful location shots of Van Heflin running away from Robert Ryan through old downtown Los Angeles, through Bunker Hill when it was still a residential neighborhood and not the locale of Disney Hall and the Music Center. 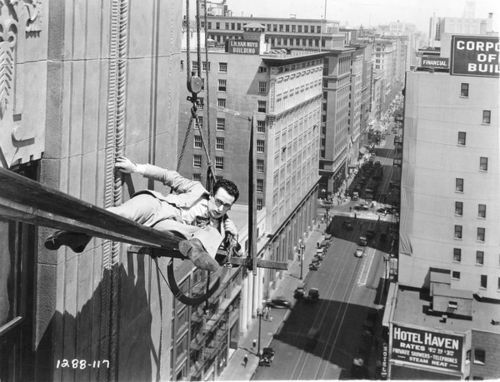 The other night I watched some Harold Lloyd shorts on TCM. First was Number, Please from 1920, mostly shot on the long-gone Pickering Amusement Pier in Venice, just south of the Santa Monica Pier. Pickering eventually became Pacific Ocean Park before fires led to its demolition in the early ’70s. Then there was Never Weaken from 1921, which first had Harold conning people in the old Bunker Hill neighborhood (one soap gag takes place in front of the old Angels’ Flight Pharmacy) and later has him dangling up on the construction girders along 7th and Olive downtown. And when I tried looking some of these things up, I came across this wonderful site by John Bengston I’ll pass along that shows all sorts of locations, then and now, from silent comedies of the era, from Chaplin, Keaton, Lloyd as well as Laurel & Hardy. It’s fascinating to see parts of the city from nearly 100 years ago preserved in classic film. Sometimes places that are overly congested are totally empty (kind of like that shot in Diamonds Are Forever of Bond driving down the Vegas strip past the long-gone Dunes into a big sea of 1971 empty desert that’s totally built up now), others have the same old buildings with different occupants. In any case, a useful source for identifying the specific street corner of where someone got hit in the face with a pie before your grandfather was born. Enjoy! i came to the valley in the fifties. When I watch Dragnet and adam 12 im so familiar to what places used to look like. On dragnet they had stopped on the 170 on ramp going north, it was new. JC Penneys was next door as well as longs drug store. I love watching the shows that bring me back to wonderful times in the valley. On the Beverly Hillbilleys you can see Wilshire Blvd. in teh 60’s. Also adam 12 is on riverside drive alot in Toluca Lake. I see a building that is now Trader joes.